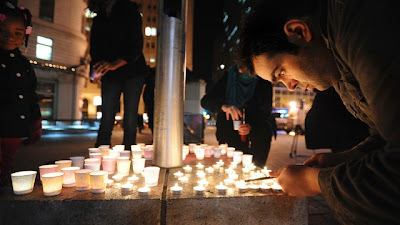 I dedicate today's post to the families of the victims in the Connecticut shooting. The weekend has been a real solemn one for the world as we all grieve over the loss of innocent children and adults as a result of the massacre. Whatever that unfolds in the next few days from the news is insignificant. The fact of the matter is that the affected families have suffered an unimaginable loss and can no longer embrace their loved ones. My heart felt condolences go to particularly, the parents of the 20 children. These little angels will always be loved and missed. It saddens me to even think of what the families of the victims must be going through. I cannot comprehend the loss. I reach out to all who read this to extend your prayers to the families and to the souls of those who so suddenly have left us. God is love, and love is what we must extend to everyone, manifested in everything we do. We stand together to support the families with our prayers as one race, one people and one global nation.